And what happens when you don't harvest the rhubarb? It grows taller and taller!!! Last week, I got out to the garden and cut about 2/3 of the stalks. I left enough for a few more pies this summer and early fall. But I wasn't relishing the thought of hand-chopping all of that rhubarb. I'm right-handed, and my right hand has developed some arthritis, making using a knife for extended periods kind of painful. It's ordinarily not a big deal, and I don't have pain, for the most part. So, I'm not complaining. But all that rhubarb. Ugh! then I thought, "gee, I have a food processor, and these sort of situations are really where kitchen appliances shine, so why not use it for the chopping?!" And that's what I did. I fed the cleaned stalks through the FP, using the slicing disk. And in about 5 minutes, it was all chopped. If I'd chopped all of this rhubarb by hand, not only would it have been painful, but it would have taken a good half hour or so. I decided to just cook all of this rhubarb into sauce for use later in fall. I got out my largest stock pot, and when all was cooked, I had 10 quarts of rhubarb sauce! Nothing wasted, my work was minimized, and now I have some already made fruit sauce for meals this fall. I ask myself why I don't always use the FP for these jobs. I think I have it in my mind that it's going to be more work to use it and wash it afterwards. But actually, I put most of the FP through the dish washer, so there's no extra work at all. Just one of those silly misconceptions about just how.hard.something.is.going.to.be. NOT! I had 4packages of pizza mozzarella languishing till I took my FB out and shredded them. I find certain parts clean better in the dishwasher. Yesterday I put up an additional 12 jars of applesauce. I used a Foley mill , what a lovely device for plenty of small crabapples. My next door neighbour gifted me a container of grapes that have plenty of seeds. I'd like to use the mill again, not sure if the seeds will be too small. At a loss what else to do, for a variety of reasons making jelly won't work. Ideas? Grape juice, for drinking or making gelatin? You can freeze the juice to use later on. What a bout fruit leather? If the seeds pass through the mill, could you strain them out with a sieve afterwards, or a colander lined with cheesecloth? Good work on shredding the cheese, and making all the applesauce! The seeds will get strained just fine. We do this every year for the juice! I find the food processor to be useful, too. However like you I usually dread cleaning it...lol. I'm getting better about just using it anyway. Is rhubarb only used for sweet dishes? Believe it or not, but I've never eaten it. Oh, rhubarb may not grow well where you live. I forget that it doesn't grow as well in some climates. Rhubarb is very tart, so some sweetening is usually necessary. But it doesn't need to be used only for a dessert. It can be made into chutney or other sauces for meat. I don't know if it's ever used unsweetened. Good question! Mmmm...I love rhubarb! I've made rhubarb cakes, pies, muffins, and jams, but have never made it into sauce. That sounds yummy! I have the same mental block when it comes to using a food processor. In my mind, it's so much work to clean it, and put it away. I don't know how I form these misconceptions. 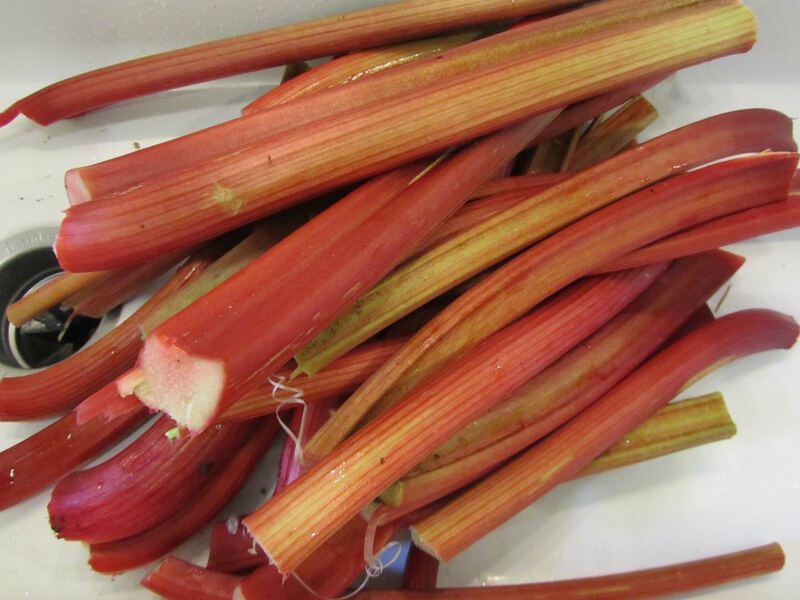 Rhubarb sauce is wonderful, and very easy! I like that it can be dessert without additional calories or fat (like with a pie or cobbler, my other usual rhubarb desserts). 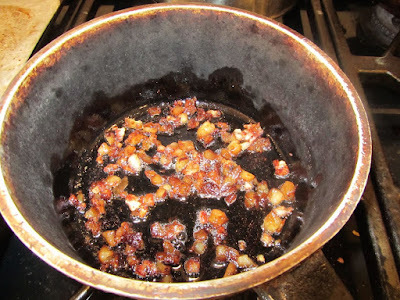 And if you happen to have a handful of berries, like blueberries or blackberries, you can add those to the simmering rhubarb/sugar, and change up the flavor. I have difficult time accepting that a vegetable can be eaten as dessert, also eating beautiful flowers. A misconception...for sure lol We tried eating yellow zuchinni flowers, not bad, but still it was only out of curiosity since we read it can be eaten as well as the leaves and fruit. As for the food processor, my husband, who does all the cooking in the kitchen, doesn't mind using it for the smallest task. Most of the time though, I'm the one washing dishes, so of course! 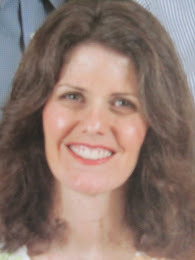 does it help to think of the "fruits" that we are already accustomed to eating as vegetables? Like tomatoes? Zucchini blossoms are delicious dipped in batter and deep-fried. Not exactly healthy, with the oil, but oh, so yummy! I've also stir-fried the blossoms with salt and pepper and butter. Pretty good, too. Ha ha! Of course your husband doesn't mind using the food processor! While it makes a little more clean-up for you, it does free up more time for him to do other chores. Have great day, yourself, YHF! Really, I must remember that about zucchini blossoms. While growing up, we ate adzuki beans for dessert, with ice cream, shaved ice, as sweet bean porridge with rice dumplings, as sweet filling in pasteries...so when I saw it classified as a bean alongside pinto and kidney I refused to think of it used in savory dishes. But adzuki is a sweet bean only because so much sugar is added. So is rhubarb. But I can see how growing up with the taste for it makes it acceptable. Thank you, thank you, thank you --- I just happen to have a huge pile of rhubarb stalks in my fridge right now, and I was dreading the hassle of cutting it all up. But now, thanks to you, I have a much quicker and less labour intensive option. using the food processor really did make quick work of all of that chopping. If we own these devices, we might as well get use from them! 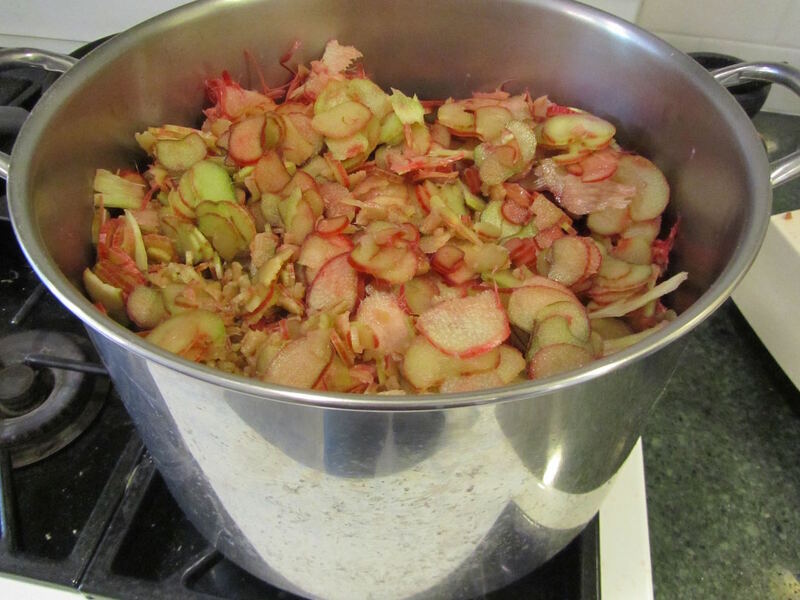 And making the huge pot of rhubarb sauce also made sense for our family, as we eat most of our frozen rhubarb as sauce, in winter. My little freezer is quickly filling up with fruit this month! In Michigan we're pretty much done with rhubarb. I kind of remember that you shouldn't pick rhubarb after a certain holiday--either 4th of July or Labor Day--I just can't remember. My favorite way is strawberry/rhubard jam. My second favorite way is rhubard/custard pudding. I'd never heard that before. If it's Labor Day, that would make sense if you want to allow the leaves to make food for the roots before winter. If it's 4th of July, maybe it's more an issue of tough stalks, or lack of water? But, I would guess that it varies by where you live. So far, though, I've always cut rhubarb through September, and my plants, I think, are doing okay. But I'm not an expert on rhubarb. I made rhubarb-vanilla jam this year that was pretty delicious. I've got a couple of jars squirreled away in the garage fridge, for winter. For your rhubarb-custard pudding, is this a rhubarb/egg/sugar baked custard? Do you add milk or any other ingredients? When you've you've let the rhubarb grow for a while, does that effect its quality? Does it get tough? Rhubarb is okay, but not my favorite so I don't have a lot of experience with it. I wonder why most of us think the food processor is not worth the effort when sometimes, it clearly is? Older stalks do seem a bit tougher, but not so tough that it would be hard to use, just a small difference. The flavor and crispness seems to be better in spring. But the late summer stalks do fine in pies, cobblers and sauce. I think rhubarb is one of those things that folks either like or they don't. You can do things to perk up the flavor, like add some berries, vanilla or orange zest. I use a lot of rhubarb, mostly because it grows so well in my yard. The flavor has grown on me over the years. I do think that as I get older, I'll rely on my FP (and other special kitchen equipment) more, even if it does mean washing it. If I can do something without pain in my hands, it will be worth the extra washing up. when I bought my FP I didn't know how much I would use it. But it turns out that I use it several times per week. So it was a very good buy. But not nearly as thrifty as yours!! Good job on taking such great care of yours. I'll remember that about oiling it, should mine stop. Thank you! I've never used my FP for making ham salad. I'll try that this fall. Thank you! That would be a great use for the small chunks and bits of ham, after all of the neat slices come off. And also would stretch the ham for sandwiches (as opposed to ham slices on sandwiches), by adding some extra ingredients to the salad. You've got me thinking about fall cooking, Belinda! !